If you’re hosting a Mardi Gras party tomorrow night, or just feel like celebrating Mardi Gras with cajun and creole recipes, don’t forget dessert! 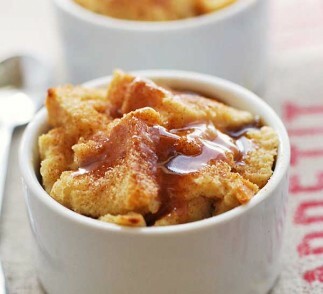 Warm and buttery, our bread pudding with bourbon sauce is a healthified adaptation of traditional New Orleans recipes. No heavy cream, very little butter, and yet, it’s just as rich and comforting as a bread pudding made with generous amounts of butter and cream. Preheat oven to 350 degrees F. Lightly spray four ramekins with cooking spray. 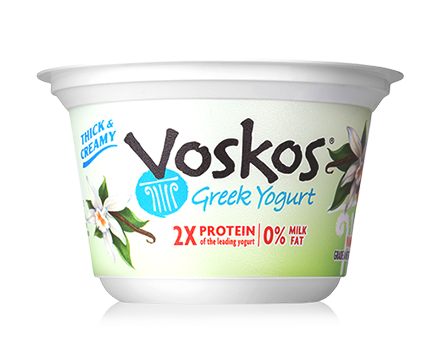 In a bowl, whisk together VOSKOS Greek yogurt, milk, egg, vanilla, maple and cinnamon. Add the bread cubes and toss gently, allowing the bread to soak up the custard. Divide the mixture evenly among the prepared ramekins. Bake 25 minutes, or until golden brown. Serve warm with bourbon sauce. To make the bourbon sauce, whisk together the sauce ingredients in a small saucepan. Heat over medium-high heat, whisking, just until sauce thickens – this should take less than a minute.